American Alligators are very large reptiles with the males being about 14-15 feet long. The females are quite a bit smaller at about 10 feet in length. Some of them have been documented as growing even larger than that. The biggest one on books that has been verified was about 19 feet long. They offer a dark coloring that also helps to set them apart from other types of alligators. There are early writings about the magical white alligator that was also very dangerous. Experts now believe those writing are talking about the albino American Alligator. They are extremely rare in the wild due to the recessive gene necessary has to come from both parents. To help attract people to alligator farms though they are often bred for this specific purpose. You will notice that the American Alligator has a very thick body which certainly enhances the power it has to offer. They have a tail that offers more power within it than the average adult may is able to offer. This particular alligator is noted as having teeth that are more powerful than any other species. You may be very interested to learn that the American Alligator is very closely related to prehistoric birds. While these reptiles are also linked to dinosaurs that connection isn’t as close as most people think. There isn’t much of a story to tell when it comes to their evolution. In fact, they are almost exactly the same as they were so many millions of years ago. Their bodies haven’t changed much at all after all of this time which is quite fascinating. Through various studies that have been conducted experts believe the American Alligator is very smart. They are also able to adapt to various changes in their environment. They can study animals around them to see how they will reach. This helps them to determine the best time to attack and how to take down their prey. They are extremely fast creatures in the water. Most people don’t consider that though. When they see such a slow moving creature on land they don’t stop to realize that their have a body that is specifically made for moving around in the water swiftly. As the name American Alligator would imply, this particular species is found in the United States. There are many areas that are heavily populated with them. For example Florida has more than two million of them. Other states where they live include Georgia, Texas, and Louisiana. They enjoy the wetlands that are also going to provide them with warm temperatures. Yet the land they used to be able to call their own has continually been invaded upon by humans. As a result they are now being found in areas of saltwater when they used to only be known as freshwater inhabitants. This is because they have to continue to move where they can establish territory and find enough food to survive. There are quite a few different food sources out there for the American Alligator to feed upon. One of the biggest items that they consume are rodents. Many believe that without them around to take care of them those populations would be completely out of control. For some there is a big decision about whether they want to deal with rodents or take their chances with alligators! Other food sources for them include snakes and birds. They will consume larger mammals as they get bigger too. This includes deer that freely roam around the areas and come to the water supply to drink. They anger lots of humans too by eating the cattle that are out their grazing and stop in for a drink water. They swallow food in very large pieces that they rip off the prey with their sharp teeth. To help them grind down what is in their stomach they consume large amounts of rocks. Some people witnessing the American Crocodile doing so on land thinks their eyes must be deceiving them. In the spring time the temperatures which are already warm will increase in the regions where the American Crocodile lives. As a result of this they will start to become interested in mating. The males will become increasingly heard making bellowing sounds to attract females. When you hear them roaring they are warning other males to keep their distance. Compared to over crocodile species this one is less aggressive on a general basis. However, when it is time for mating they can become very territorial. Males may spend lots of time standing off with each other in order to protect their territory from invasion. When they are able to find a female they are going to do all they can to mate with her. After mating has occurred the female will instinctively know she needs to create a home for her eggs. This is offered in the form of a nest that she makes out of leaves, twigs, mud, and anything else she can find. She has to make it large enough for 20 or 50 eggs to fit inside of it. The walls need to be thick so that they can stay as warm as possible in there. She will carefully guard them as often as she can. Other than going to the water for food or to cool off she is committed to keeping predators away from her eggs. It takes only about 65 days for the young to be hatched due to the warmer temperatures. She will help them get out of the shell and into the water. She can care for them for about five months which is much longer than most other reptiles. However, she will also lose the majority of her young by that time due to various predators. When they are small they can be fed upon by birds and by turtles. With so many of them to watch over the mother simply can’t protect all of them at once. Other crocodiles may come to feed on them too if they can’t get enough of other sources of food out there. They are going to consume anything they can in order to ensure their own survival. 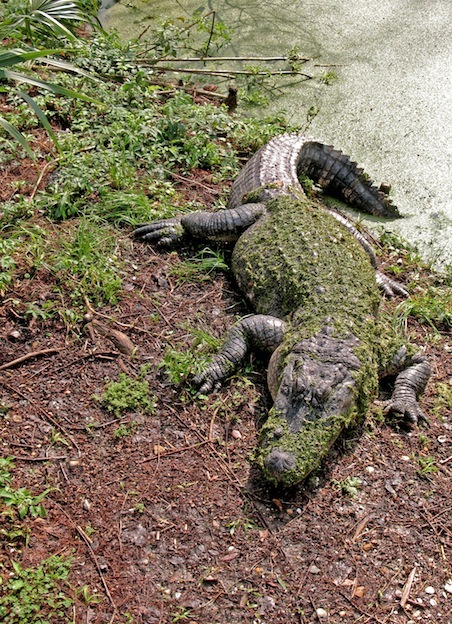 As these alligators become larger though they are less likely to be consumed by such predators. That doesn’t mean it is all easy going for them though. The biggest problem they have to deal with is humans. 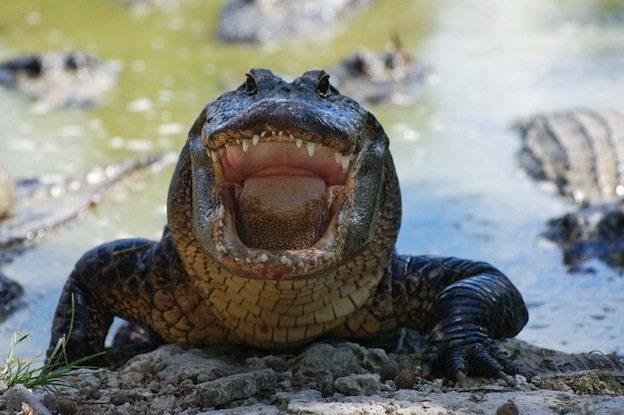 In many areas people are terrified of the American Alligator. They want them to be killed so that they don’t have to share property lines with it. They are often killed as part of spectacular hunting expeditions as well. People from all over the United States as well as from some other countries come to try their luck at taking one down. The pride they get from successfully hunting such a large and feared creature is like no other. They are also hunted for the use of their skin to create leather products.